Yesterday evening current Suffolk Ladies' Champion Emilia Jewell took on former Champion Vicky Allen to decide the fate of this year's competition. As the match started, Emilia was on 2/2 and Vicky on 1½/2, so the winner would gain the title (or a draw would be sufficient for Emilia). 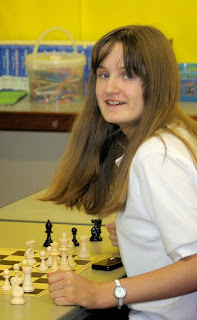 The match was very close fought, with Vicky a pawn ahead early on and then an exchange up. But a blunder by Vicky allowed Emilia to win back the exchange (see below). The game was petering out to a draw, but Vicky ran out of time. Generously, Vicky commented afterwards that "Emilia's endgame technique was better than mine!" Emilia played 29...Nf5+ (the best move in this position), to which Vicky replied 30. Ke4? So Emilia was able to win back the exchange with 30... Ng3+. There were only four entrants in this year's Ladies' Championship, with Vicky and Anita Somton sharing second place on 1½ points. Last place went to 11-year old Bethany Young from Stowmarket, who failed to score. surly after Nf5 Ke4 Ng3+ Kxe5 Nxh1 Rxh1 the game is completely winning for white?? First, please state your name (or sign up to a free Google account). The game continued as follows (after 32. Rxh1): ... Ke7 33. Rd1 Re8 34. d6+ Kd7+ 35. Kd5 b6 36. b4 cxb4 37. axb4 Re6 38. Kc4 Rxd6 39. Ra1 b5+ 40. Kc3 Ke6 41. f4 g6 42. g4 h5 43. Re1+ Kf6 44. Re5 hxg4 45. Hxg4, at which point Vicky lost on time. It's difficult to see, because White's 33rd move looks natural, but instead Rc1 would probably be winning..